Appreciating the church building as a place where the Christian is at home is to enter into the already and the not yet of Christian existence. Already the Christian has been baptized into and shares the very life of the Trinity, but the fullness and permanence of that life is not yet realized. At the same time, appreciating the church building as a place where the Christian is at home means entering into the kairós (the time of salvation), and not the chrónos (the measured time of the clock). The Christian, while living in this temporal world, is on pilgrimage to the Kingdom of God. Even the words which we use to speak of ourselves proclaim this. The Greek paroikía (which comes into Latin as paroecia and into English as parish) means a group of people who are sojourners in this world. So our days are spent sojourning (i.e., not being at home in this world). A problem arises, however, when we transfer this idea to our participation in the sacred liturgy. So often people think and act as if what they do outside of church is the real world, and what they do in church is just a break from that reality; or they might think of going to Mass as another thing to do (e.g., Catholics go to Mass, so as to give God one hour each week in exchange for the other hours of the week that He has given to us). A liturgical way of looking at things is, however, quite different. What happens in church is not a break from the real world, but a break from distractions in order to enter consciously into what is really real as the ancient philosophers understand it—moving, if you will, as Jean Daniélou would say, “from shadows to reality.”1 This, without a doubt, has consequences for the construction of churches. Christians, I believe, need to feel at home in the church building. In Baptism, they have been adopted as children of God and have received as well a sort of passport indicating that their true homeland is in heaven. For that reason, death is a door and life is changed, not ended. So, what does the Kingdom of God look like or feel like? None of us knows the complete answer to that, but a few reflections on churches and church architecture might be helpful to discover what it means to feel at home in a church. To borrow a title from Fr. Robert Barron, the church building, I believe, must be “heaven in stone and glass.”2 If the church building is in fact that, it means that one should experience what it means to feel at home in church. A number of years ago, I realized this in a very personal way. 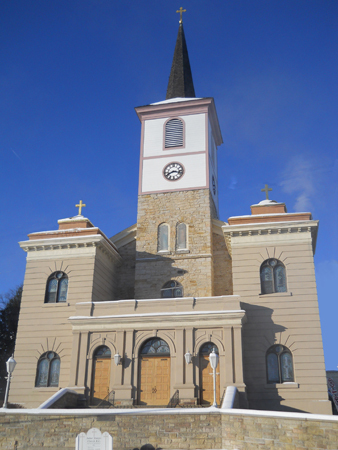 Saint Mary Church, Saint Marys, Pennsylvania, built 1852. Photo: Kathy Meyer. When going home to visit my family, I would customarily first stop into the church where I was baptized to pray some of the Liturgy of the Hours before visiting my family. In order not to be disturbed, I would go up into the choir loft and sit in one of the pews hidden away from anyone who might stop in church. On one such occasion, I asked myself why I liked this church so much. The answer came rather quickly and simply: because the Lord is in the center and I feel that I am surrounded by the angels and saints. This church, which goes back to 1852, has the tabernacle in the center of the high altar. Both the high altar and the side altars have remained relatively untouched since they were first installed. The Blessed Virgin Mary is depicted in the center image of the high altar with Saints Benedict and Francis, Saint John Neumann, and Blessed Pius IX. The side altars have statues of Saint Joseph, Saint Anthony of Padua, Saint John the Evangelist, and Saint Rose of Lima, among others. In addition, two angels are depicted on either side of the tabernacle bowing in adoration of the Blessed Sacrament reserved there. Finally, there are also the stained-glass windows and the large painting on the ceiling. 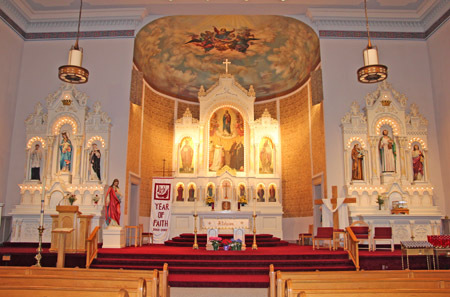 Sanctuary and side shrines at Saint Mary Church, Saint Marys, Pennsylvania. Photo: Kathy Meyer. I tell that story because a church is a place for both public and private prayer. It is the place of the sacred liturgy, the public prayer of the Church, and often enough it is the place of the private prayer that flows from and leads back to the liturgy. In the church that I have just described, it is easy for one to feel that his true home is the Kingdom of God—with the Lord in the center while all of the angels and saints surround him in worship and praise. To enter there is truly to come home in the most profound Christian sense. The rest of life finds its culmination and integration in what is depicted there—being at home with God and all the angels and saints. Artistically and architecturally, this integration means that when one is distracted in the sacred liturgy in a church like that, one is distracted into the mystery and not out of it. Instead of counting rows of bricks in a nondescript sanctuary, he is distracted into the Kingdom of God with all the angels and saints. Churches like this center one psychologically. The feeling of being at home is enhanced even more when one reflects on the classic placement of the angels and evangelists in many of our parish churches. So often, in the sanctuary of our churches, angels are depicted because the church is the place of divine worship, and that is one of the functions of the angels. The evangelists are also often depicted in the sanctuary. They are the ones who tell the Christian story, which is, as well, the story of each and every believer. If you do not know the Christian story, you cannot enter into the Christian mysteries. For that reason, churches of the Eastern tradition also have either the Annunciation or the evangelists painted on the royal doors in the center of the iconostasis. Going home also means being transfigured. One is changed because one is Christian. This is portrayed in an outstanding way in the church of Sant’Apollinare in Classe near Ravenna in Italy. In the apse mosaic, we find a symbolic representation of the Transfiguration of the Lord—with Christ in the center of a jeweled cross, Moses and Elijah on either side, and Peter, James, and John below. Since the figure of Christ is basically just His face, and since it seems small in light of the whole mosaic, one thing that struck me about this depiction is that the closer you get to the cross, the closer you get to Christ. But at the same time, the closer you get to Christ and to the jeweled cross that embraces Him, the closer you are not only to Christ but also to the glory of the cross. The Transfiguration of the Lord depicts a suffering love, a life poured out for our salvation, which is nothing if not glorious. 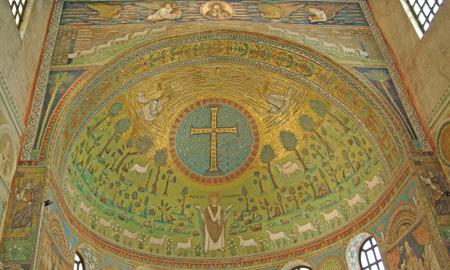 Apse mosaic detail at Sant’ Apollinare in Classe, Italy. Photo: Berthold Werner. For the Christian, therefore, being on a journey home means that God allows us to experience here and now, even if just occasionally, a taste of eternity and a life surrounded by all the angels and saints. Entering into a church means being willing to be immersed in and embraced by the kairós. As Christians, when we enter into a church, we attest to the fact that the Christian story is our story, that the Paschal Mystery includes our own personal mystery, and that God in His love and mercy has chosen to transfigure us as His beloved sons and daughters in a glory beyond all imagining. 1. Jean Daniélou, From Shadows to Reality: Studies in Biblical Typology of the Fathers (London: Burns & Oates, 1960). 2. Robert Barron, Heaven in Stone and Glass (New York: Crossroad Publishing Company, 2002). 3. See Benedict XVI, Post-Synodal Apostolic Exhortation Sacramentum Caritatis (Vatican City State: Liberia Editrice Vaticana, 2007), n. 69.